Get a perfectly smooth application of powder or cream foundation, primer, or blusher in seconds with these cute, reusable sponge applicators. 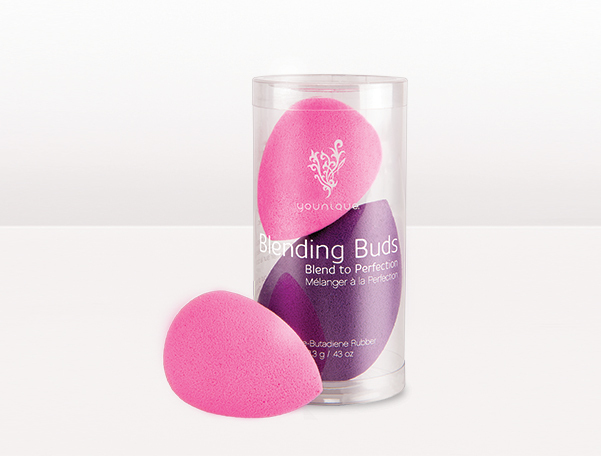 Contains two sponges, a small pink bud for fine detail areas, and a large purple bud for large area application. Perfect for applying Younique Powder, Cream or Liquid Foundation. The Beautyblender is a very popular must have makeup tool, so when I saw Younique was coming out with something similar, I knew I wanted to try these out for myself. I have always had issues with foundation just not looking too even, lines around my jaw and annoying streaks. I love applying foundation with my Younique Blending Buds, all you have to do is get them a little damp and pat the foundation around on your skin. The results are an amazing flawless, smooth application that looks so seamless and natural. You will love it!